All transactions are safe and secure with a reliable history in online purchasing behind each of our associates. Buy the Addams Family Portrait t-shirt to own Addams Family clothing and merchandise. 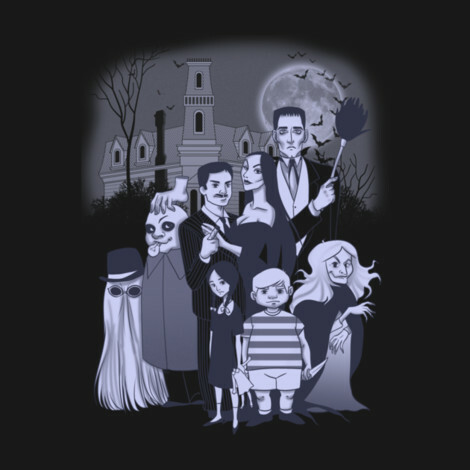 This Addams Family tee features a family portrait, including siblings Pugsley and Wednesday. Since they are close in age, they have adventures unlike any others, including trying to figure out if their baby brother, Pubert, will bounce if dropped off the house. The newest addition to the family manages to foil their plans every step of the way though. If you wish you had a sinister family and siblings like these two, then snag your tee today. Convince your sibling to dress up with you. The Wednesday Addams dress and striped Pugsley Addams costume are available above. In addition to the Addams Family Portrait tee above, browse the Addams Family Clothing Gallery for more apparel like men's and women's clothes, kids shirts or hoodies.